Hey friends — I mentioned this on Just Bee’s Facebook page, but I have been super aware that I haven’t been blogging as much lately, and I really want to get back into it! Thank you so much for your grace and for sticking with me as I find my footing as a new mama! 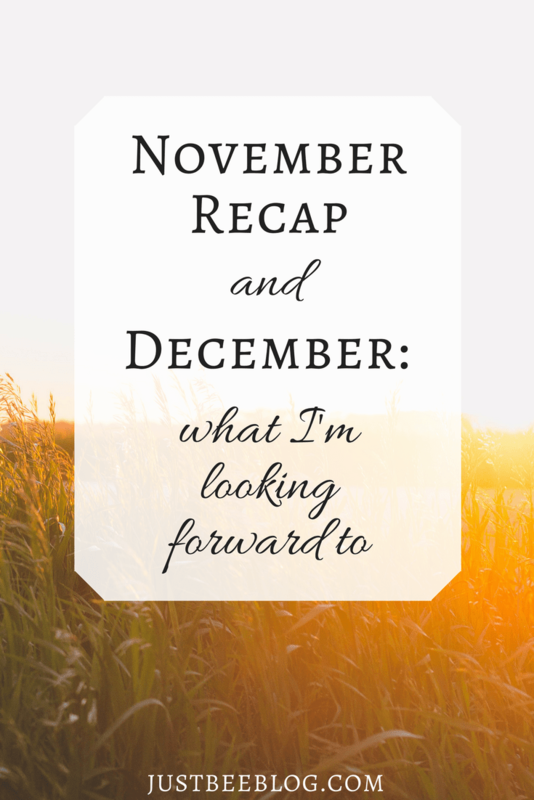 Since we’re already into December and I haven’t yet done a November recap post (whoops! ), I thought that today I’d just play “catch-up” and write a combo post! Honestly, November flew by!! I’m sitting over here, shocked that it’s December 7th already! 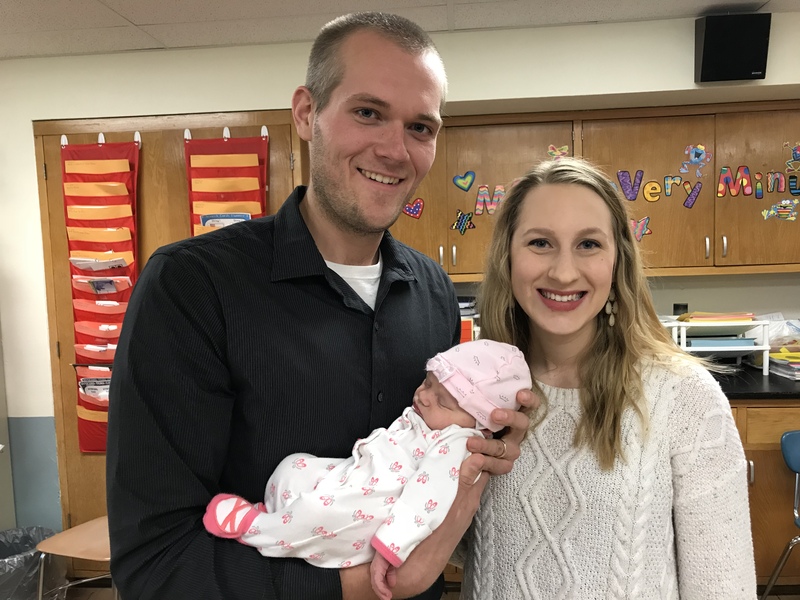 Since Sophie was born on October 16th, those last couple weeks of October were also a blur. 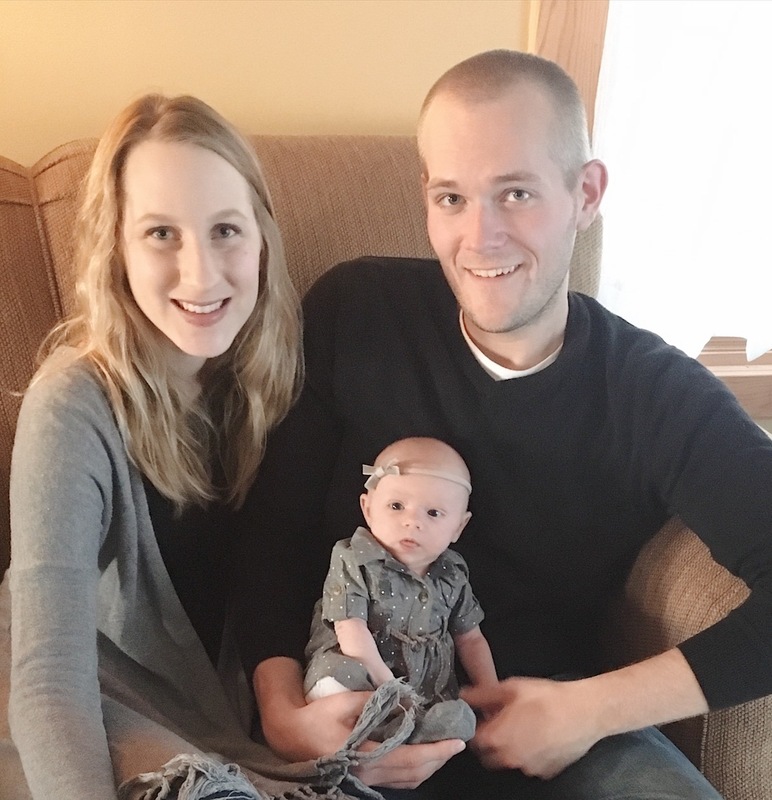 I would say that in the month of November, Bjorn and I really began to understand what life with a newborn would be like! 🙂 We have had so much available help – with baby-holding or with house projects – and we are so grateful for that! As Sophie began to be more aware of the world around her, and she began to grow even more, she had her bouts of fussiness (particularly in the evenings!) that we learned how to soothe her through. I can chat more about that in her 1-month update post, which will hopefully be up on the blog soon! But, all in all, our little Solveig is doing so well. She is SUCH a sweet girl – she’s napping in her DockATot next to me with the cutest peaceful expression on her face right now as I type. 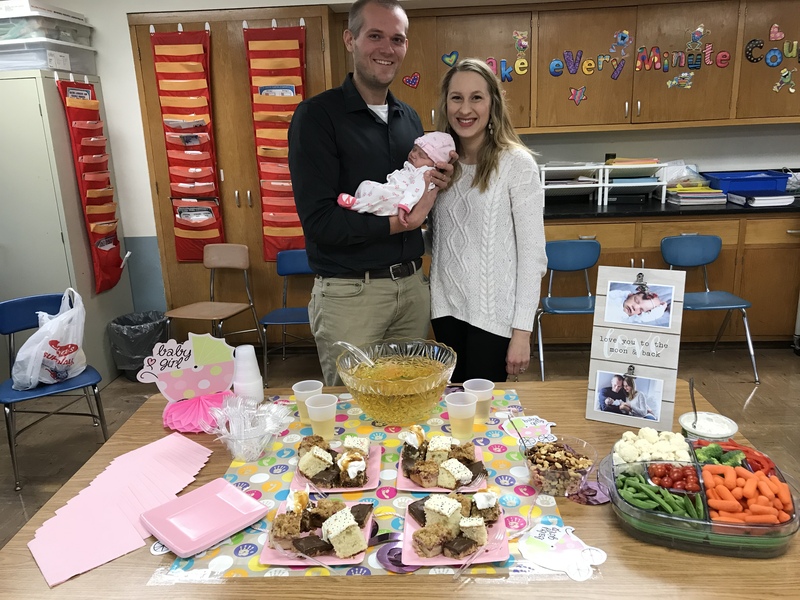 The teachers at our school (Bjorn and I teach in the same combo elementary-middle school) threw Sophie the sweetest baby shower! 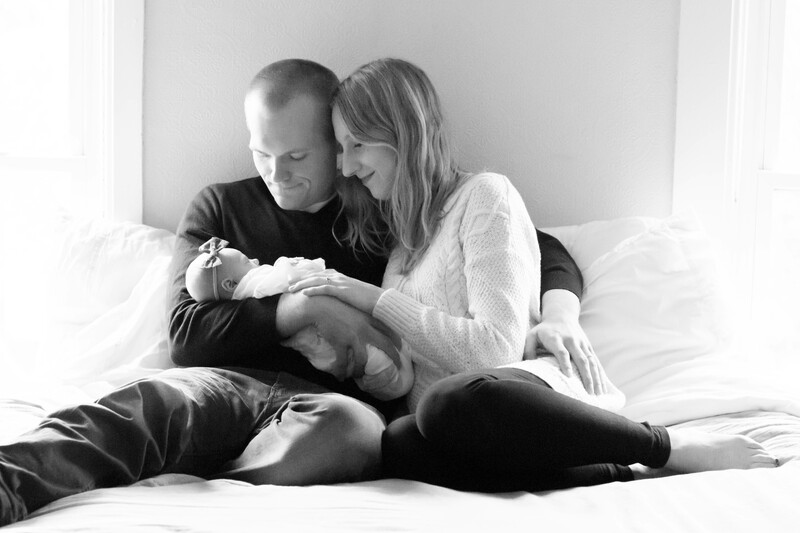 Bjorn and I were overwhelmed and really touched by the number of people who came, the thoughtful gifts, and all of the “congratulations.” It really warms my heart to think of this community embracing her with so much love! We celebrated Thanksgiving around here with Bjorn’s family this year. What’s nice is that my in-laws live only a few miles away, so doing this holiday close to home felt more feasible this year with our new baby! I made 3 desserts this year: a cranberry-apple pie, a no-bake Reese’s peanut butter cup pie, and pumpkin layered cheesecake. Yum! Sophie was about a month old at Thanksgiving this year. She basically got cuddled and held the entire Thanksgiving day (which she LOVES!). She wore a cute newborn outfit for the occasion. 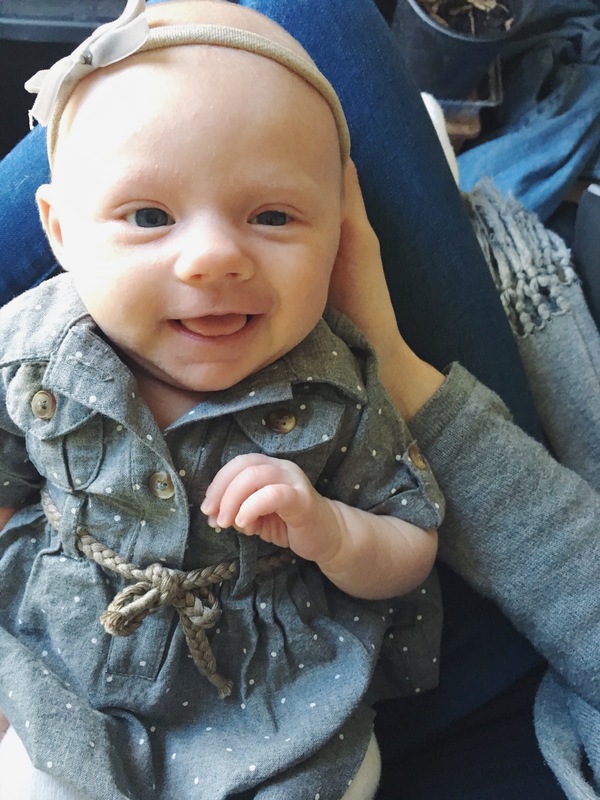 And – one of my favorite parts of the whole day this year – Sophie gave me some amazingly sweet, big smiles upstairs after I finished feeding her! Those smiles (not to mention, our baby girl) were a special gift to be thankful for this year! I had been looking forward to seeing Sophie smile (on purpose!). It has been so much fun seeing her interact with us more and more. 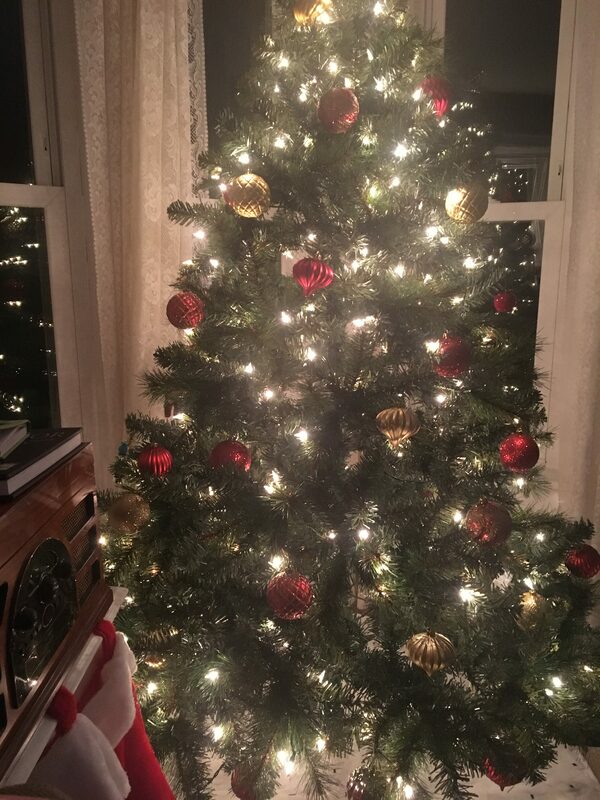 The day after Thanksgiving, I dragged our tree out of storage and began decorating for Christmas! (We waste no time around here getting in the Christmas spirit!) Sophie has absolutely loved the Christmas lights on the tree, so I even took some extra lights and hung them up in a few more windows around the house. It is so perfectly cozy and magical at night now! Sophie has had some fun visits with my parents lately. They have been a huge blessing to us, driving the 2 hours down here to help with house projects or with our sweet girl as we got used to being parents. And when Bjorn has had army drill, Sophie and I have accompanied him (he stays with my parents on his drill weekends) and she got to have some fun grandparent time that way, too! 🙂 Family truly is a blessing. Sophie also got to meet my friends Jordan and Emily! I had my 6-week checkup at the doctor’s. Everything went well and again, I’m grateful! My hemoglobins are still a tad bit low, so it looks like I’m borderline anemic…I’ve been dizzy on and off since having Sophie, so that’s probably why. So, I’ll just keep on taking my iron pills! I had been looking forward to getting into a routine with Sophie for the month of November. That happened in some smaller ways. 🙂 Of course, no set schedule is nailed down, but Sophie and I enjoy our slower mornings together. I shared our Peaceful Midmorning Playlist – my favorite Spotify playlist – on the blog recently! Christmas!! Of course! It’s such a special time of the year – not only because of the family, food, get-togethers, presents, and decorations…we have so much to be thankful for this year, especially the gift of salvation in Christ. It will also be wonderful to make some memories as a family of 3 this year! Celebrating New Year’s Eve with friends! Having some additional time with Bjorn. With farming tasks wrapping up for the year (well, truly, farming work is never done, but it is 8 degrees today, so…), and cross country practice done, Bjorn will be around a bit more. Sophie loves cuddling with him and smiling at him, and I love having my man around, too! Babies!! My friends Jordan and Courtney are each due this month and I cannot WAIT to meet these sweet little babies coming so soon! Can I list it again? Getting into more of a routine around here. I have days where I can get tons of things done – laundry, emails, cleaning, cooking, etc. – and then other days, I feel like I barely fed myself! Ha. So, I am looking forward to falling into a better routine. I won’t get too uptight about it, though. Getting more sleep! 🙂 Sophie has been sleeping better and better as the weeks go on. I got a 5 and a half hour stretch last night and that is the longest I’ve gotten since October 16! 🙂 So, it’ll be fun to catch more sleep, little by little. How was your month of November?? Are you looking forward to something specific in December?